Information on the current status of the European grid and the expected evolution in the hours to come is already available with current grid management procedures like the Day-Ahead Congestion Forecast (DACF). The increasing infeed from intermittent renewables like wind as well as short-term trading implies that possible deviations from the expected values become increasingly important. Consequently point forecasts (expected values) only provide limited information on possible security risks. Securing the stable operation of the electricity grid requires not only the consideration of the most likely (or expected) development but also of possible deviations from this scheduled path. Therefore point forecasts will be replaced by forecasts of distributions (including but not limited to extreme events). A major challenge for these distribution forecasts is to describe appropriately the spatial and temporal correlations of distributions. In-depth statistical analysis is needed to identify valid models which are at the same time parsimonious enough for practical application. Besides distributions for renewable infeeds and short term trading, also conventional load forecast errors and power plant outages contribute to the uncertainty in future system state and will be considered. A further important step for the security analysis is then to conclude from the stochastic infeed and withdrawal distributions on the corresponding system states, notably including load flows. Thus a set of methods for deriving the distribution for the future state of the electricity grid will be developed. A particular emphasis thereby is thereby to be devoted to the identification of critical system states, which endanger system security. New devices like phase shifters and FACTs provide the grid operators with improved possibilities to control load flows and optimize power transit. Yet the increased degrees of freedom also require improved methods for identifying optimal solutions. Algorithms for an enhanced optimal power flow (enhanced OPF, EOPF) considering uncertainties will be developed. The goal of the EOPF is to determine optimal topologies as well as set points for load flow control devices in order to minimize redispatch volumes while maximizing possible power transports in critical system states and avoiding violations of security conditions while taking into account the uncertainty of the system state’s development Remedial measures have to be chosen for some future state yet unknown. Figure 1 shows a simplified outline of this situation. 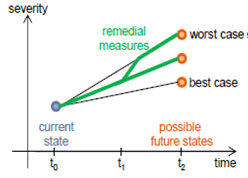 In the figure above, the path of remedial measures chosen is indicated by the green line. At first, measures for a medium severe scenario might be chosen. If at t1 some event or development shows that the system will rather evolve towards the worst case state, the EOPF result has to provide for the possibility of changing the strategy at this point. The time between the current state at t0, when a critical situation is anticipated and the EOPF is executed, and the future state at t2 may be a few hours during which the system still evolves. For example planned or unplanned plant outages or significant changes in renewable infeed can take place during this time. Risk-based system security concepts will be implemented in order to assess the probability of contingencies and to estimate the severity of potential events. This knowledge can be used to optimize/maximise power transits and thus facilitate market operation without jeopardising system security. Special attention will be paid to the influence of fluctuating generation resources on power system operation. The methods applied will specifically take into account state-of-the-art technological measures to influence power system operations (FACTS, phase-shifting transformers, real-time monitoring of thermal line ratings, battery energy storage systems for reactive power support etc.). Additionally, the framework can be used to assess the influence of different operational / market rules on system security. The concepts will be developed comprehending the structure of the European interconnected power system with a number of separate control zones. The results of the work packages forecasting, optimization and risk based assessment concepts are the input for developing the prototype toolbox. Therefore the results have to be reviewed carefully in order to identify those methods most appropriate and promising for a usage in the different time steps of operational planning (starting day-ahead) as well as daily operation of the TSOs. For a successful realisation of the tool box it is crucial to achieve usability for system operation. For this purpose it is necessary to develop a suitable usage concept in collaboration with the TSOs in order to achieve an applicable tool box and take the full advantages for system security and optimal grid utilisation. The different components of the toolbox have to be integrated in the existing processes of network operation. Finally the functionality of the developed toolbox is demonstrated using appropriate test cases. The test results will particularly be used to identify needs for further harmonisation of operational requirements in TSO cooperation rules and to provide possible defence actions and methods to achieve the European-level coordination of defence plans and black start as far it is concerned in the toolbox.